This is my travel journal chronicling my 2011 tour of Siberia, visiting with our Russian Lutheran brethren in the Siberian Evangelical Lutheran Church. Hopefully and God willing, there will be future adventures for me there. The title is based on a remarkable book (that I actually read after returning home from Russia) called Travels in Siberia by Ian Frazier. I found much of his writings to mirror my experiences as an American in Siberia - though Mr. Frazier has made many more trips and experienced many more things than I did - not to mention that he is a better writer. At least for now. Practice makes perfect! Frazier's book (here is a review) is also an interesting look at Russian history and gives an overview of the past writings of American travelers to Siberia. I'm humbled to be yet one more. I hope that readers of TILS vicariously travel with me and enjoy what I have posted. I hope that it provides a small window into the life and work of the pastors and laity of Siberian Lutheranism (and their extraordinary history) and Russian culture in general. It is also my hope that readers will: 1) Pray for our Christian brothers and sisters in Russia, 2) Support the outstanding missionary work of the Siberian Lutheran Mission Society, and consider sponsoring a Siberian congregation, 3) Consider visiting Russia for themselves, 4) Support the work of the faithful LCMS pastor Rev. Prof. Alan Ludwig, who has taught at the Lutheran Theological Seminary at Novosibirsk for many years and has much of interest to say from his perspective, and 5) Read Ian Frazier's wonderful book Travels in Siberia (which by the way is available on Nook and Kindle for $9.99)! Of course, a disclaimer is in order: Ian Frazier has never endorsed this blog, nor have I ever met him or communicated with him. I thoroughly enjoyed his book, however, and am playing with his title for the title of my blog. However, Mr. Frazier, if you're out there - I would love to hear from you some time! I grew up in Cuyahoga Falls - and for some reason, Siberia seems to attract people born in Ohio who feel compelled to write about it. I really did enjoy your book, and I hope you are pleased by my reference to it. One other disclaimer: other than being a supporter of the Siberian Lutheran Mission Society, I'm not affiliated with SLMS. The material on this blog is mine, and I take sole responsibility for it. Note: Since I arranged this blog chronologically - which is backward from the way blogs usually work - the buttons at the end that say "Newer Post" and "Older Post" are reversed - just as the "hot" and "cold" water taps are often reversed from the way we're used to them in the states. In other words, if you want to read the next day's installment, click "Older Post" instead of "Newer Post." Just consider this another delightful quirkiness of an American writing about Siberia. Большое спасибо! Thank you very much! knobs and settings - not to mention a radio. Dan offers some cheese and bread - which I am happy to accept. I get on the computer, and have a slow internet connection through Father Sergey's cellphone USB gadget. I am able to finally IM with Grace. It is still her birthday there. It's kind of like when the day was lengthened for Joshua. Grace's birthday will be about 36 hours this year - not counting our family tradition of extending birthday celebrations over several days. We are both very happy to "talk" to each other, as our separation is getting very long (our access to the Internet has been sparse since being in Yekaterinburg). We have been married 17 years and have spent only a few nights apart - the first time being when I toured with the Concordia Theological Seminary Kantorei as a student about ten years ago. Needless to say, I am greatly homesick. Fathers Alexey and Sergey arrive about 10:30. Sergey is waiting for technicians to install a wireless router - which has to go through the heating duct of the building. Father Daniel and I join the two of them in the kitchen for tea. We have a long extended discussion about the movie Catholics: A Fable - which Alexey enjoyed very much. There are great parallels to today's liturgical conflicts and pressures for the church to change with the times. It is an intriguing film on many levels. Sergey announces that we now have wifi. We take it for a spin. I download three free books by Dostoevsky - including Crime and Punishment (the detective character in which is the inspiration for the character Columbo) - which Dan is reading. Father Alexey shares with us that he has just received an e-mail from a young man who attended one of our summer seminars and now desires to enroll at the seminary in Novosibirsk. He remarked that at the summer seminars, the Gospel was clearly taught, articulated, and proclaimed. Alexey notes that his trip has been fruitful, yielding at least two likely prospects for the seminary. At least in my admittedly limited experience, Russians drive far more aggressively than we do - but without the road rage. They do more passing on the highway. It's best not to look. I begin reading Crime and Punishment on my Nook. In the opening paragraphs I run across this poignant quote: "It would be interesting to know what it is that men are most afraid of. Taking a new step, uttering a new word is what they fear most." Father Sergey, our driver, plays an eclectic mix of music in his car. He and Alexey speak animated Russian in the front seat. We are now 41 km from Chelyabinsk. We begin to see the smokestacks that epitomize this industrial city . We arrive at the Malachite Hotel, a large Soviet era establishment downtown. There is a lot of English in the lobby as well as the feel of the older Soviet hotels. We check in, filling out forms and leaving our passports. There are clocks on the wall showing the time in Moscow, Paris, New York, and Chelyabinsk - all in Latin (as opposed to Cyrillic) letters. The lobby has a dated (or perhaps more flatteringly, "retro") feel to it with wood paneling and steel lettering. Customer service is very good, though the staff speaks only Russian. We rely on Father Alexey as translator. The elevator is a dinosaur, complete with clunky manual push-buttons for the floor numbers (reminiscent of the old-fashioned car radios with the push-buttons) and a button to make the thing go. It lurches and clunks loudly upon reaching the desired floor. I will be sharing a room with Father Alexey tonight, and Father Daniel will have his own quarters. Our room is small but comfortable. After checking in, we walk around the corner to the pedestrian mall. The weather is pleasant and a lot of people are out walking. We buy a few souvenirs and take pictures as we head off to eat lunch. Chelyabinsk is often symbolized by camels - though they no longer live here - as a nod to the history of the nomads that used to travel on camelback. Hence the camel on Chelyabinsk's city coat of arms and the frequent statuary depicting camels. The Ural region is also famous for its pelmini - which are like little raviolis stuffed with meat. They are boiled and served hot. It was originally peasant food that sustained the people of the region all winter. They were made after the harvest time and kept outside frozen, to be eaten throughout the winter. We pop in to a popular pelmini restaurant. I have the now-familiar salad of tomatoes and cucumbers, bread, and a boar pelmini - along with a cup of tea. This place is well-known and offers many exotic types of pelmini. It's very good and filling! After lunch, we drive to the place where Holy Spirit Lutheran Church meets - a community center where many groups rent space. The usual room in which the church meets was rented to the church today for a special service of Vespers and Holy Communion because of our visit. However, the room was double-booked for a party of some sort. So the church was given a beauty salon room for the evening. We pull in front of the building and Father Vlad (Vladislav Inanov) emerges with a big smile, gives me a large embrace, and says in English: "Hello, my friend!" We make our way inside past a receptionist at a desk. 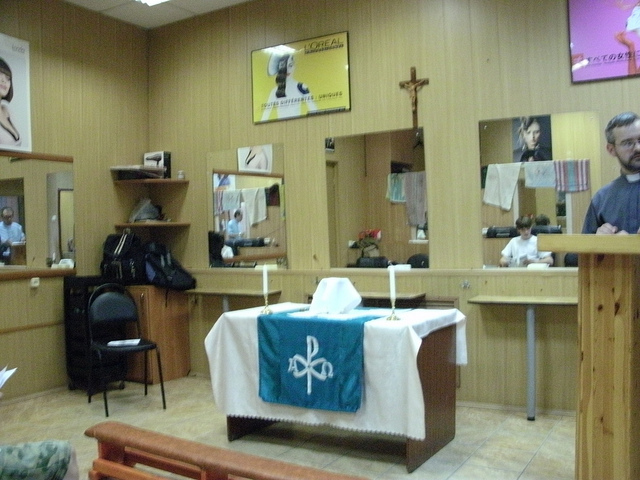 We wind our way to the beauty salon in which a small desk was placed in the middle of the room and transformed into an altar. A crucifix was hung on the wall between two salon posters advertising beauty products. The room is surrounded in mirrors. Father Vlad quips that the mirrors make it seem like more people are in church. Father Sergey discreetly removes the towels that have been hung over the ledge to dry. A small padded kneeler, just big enough for three, is reverently placed in front of the altar for communion. 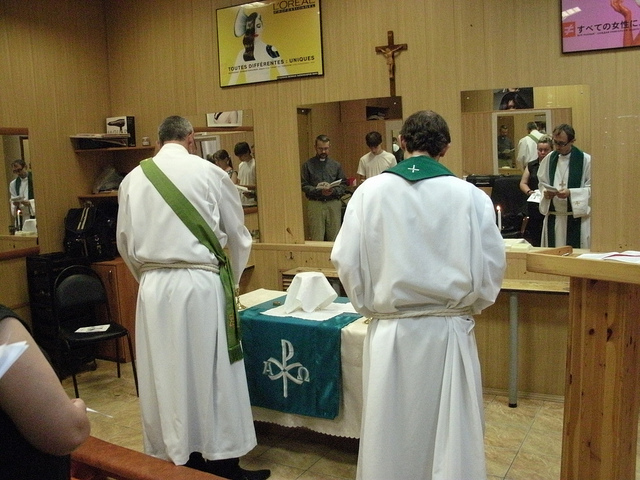 Father Vlad leads the service, and Deacon Victor assists. We sing hymns and Psalms a capella. The small congregation sings with gusto. The Mass is dignified in spite of the surroundings. Father Vlad is a capable and devout celebrant. We all take the Holy Supper together. Video excepts of the liturgy follow: the opening hymn, the opening prayer, the Kyrie, Confession and Absolution, the Psalm, the Reading, the Creed and Lord's Prayer, the Consecration, the Agnus Dei, the Post Communion Canticle, and the Benediction. This is for me one of the many high points of our trip. Only a few weeks before, I had confessed to Vlad that it was a dream of mine to come to Chelyabinsk and take the holy sacrament from his hand. Not only did I make it to Siberia and to Chelyabinsk, we were able to partake of the Lord's Supper together. A short description of this glorious event appeared on page two of the September 2011 newsletter of the Siberian Lutheran Mission Society: "With God, All Things are Possible." 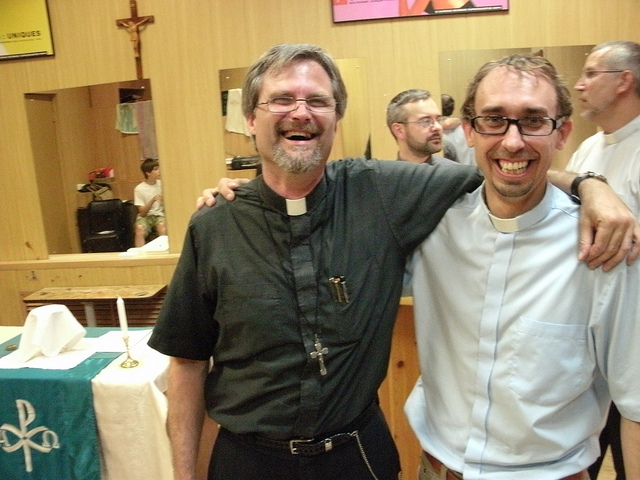 Afterwards, father Daniel and I were invited to make a few remarks. I took the opportunity to present a plaque hand-made by a member of my congregation, Ron Cantrelle, which reads in Russian: "Holy Spirit Congregation" carved into a piece of Mississippi cedar. The parishioners are very appreciative, and take turns sniffing the cedar. They are a small but faithful parish. Father Vlad is very personable and friendly. He and Victor are both Ukrainians and I am told that Ukrainians generally smile more than Russians. Vlad's wife Svetlana came to the service a little late with her 6-month old Melissa and her well-behaved 3-year old Sophia. Victor's wife Natasha (who is well along in pregnancy) is there with their teen-age son Nikita. It was a real joy to partake of the Divine Service with our sister congregation and to take the body and blood of Christ from the hands of Vlad and Victor. Afterwards, we move the furniture down the hall to the original room - which has since been vacated. We head off to a park near Vlad and Svetlana's apartment building for a picnic. And was it ever a picnic! We walk a ways to the woods by way of a path. Finding a suitable spot, Vlad and Victor assemble a small metal portable barbecue pit. They make a charcoal fire and lay out huge chicken shish-kabobs on the flame. It is my understanding that Deacon Victor used to be a chef, and he presides with aplomb over the burnt offering, fanning the flame with a plate and wielding a butcher knife. He smiles, laughs, and cracks jokes - none of which I can understand. The assembled congregation is relaxed and also laughs a great deal. We sit on blankets around the fire in a small clearing. Vlad and Victor are a good team and are obviously comfortable working together. They were actually laymen together in a congregation in Ukraine in the more liberal ELKRAS church - but sought a more faithful expression of the faith among the Siberians. We sit in a circle around the fire. 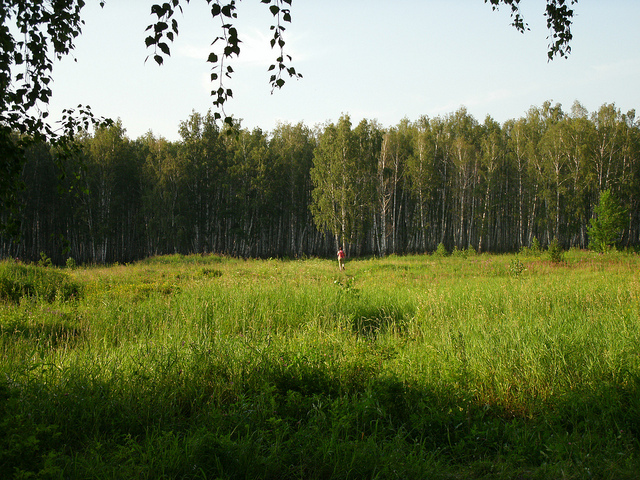 The weather is beautiful and provides a marvelous view of the birch forest. The ladies prepare salads and drinks. Sophia plays in the dirt with a stick. Most of the conversation is, of course, in Russian. Sophia is shy around me. She has large precocious brown eyes and an expressive face. I win her over with a gift - a little green, yellow, and purple cat from Mardi Gras. She is also wearing a little Hello Kitty bracelet. The gift is a hit, and she excitedly shows her mother who smiles warmly while thanking me. We dine and converse, sitting on blankets until nearly sundown. I distribute a few gifts: tee shirts, flashlights, some pocket knives inscribed with scripture from a member of my congregation who is a retired Navy Seal. I present a little stuffed dog to Melissa - which Sofia also claims unto herself. Afterwards, we say our goodbyes, and Vlad joins Dan, Sergey, Alexey, and myself for a brief tour of the city of Chelyabinsk as the sun begins to set. Father Sergey is our driver. 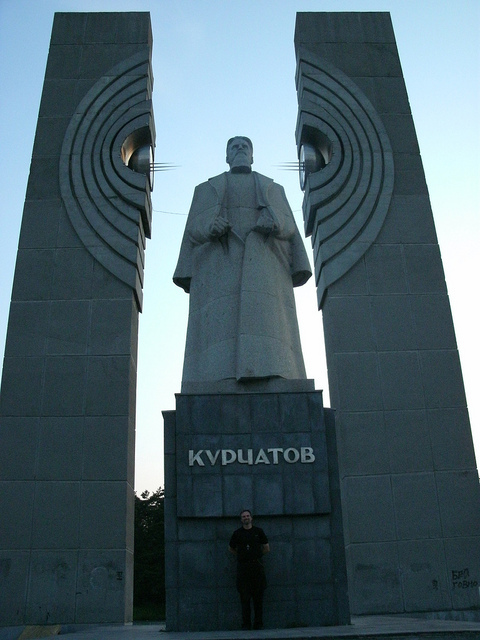 We visit a massive cold-war era monument at the end of Lenin Street in honor of Igor Kurchatov, the father of the Soviet atomic bomb. Serge quips that the monument's purpose is to get foreigners to take pictures. We all have a laugh, and sure enough, Dan and I hustle out to take pictures. A bunch of young people are hanging out nearby. It's 11:00 pm on a Monday night, and a lot of people are still out and about. The young people are amusing, as the guys are hanging out with each other, looking at one another's cars, while the girls likewise are clustered together, looking bored, dressed as if they are going to a wedding. 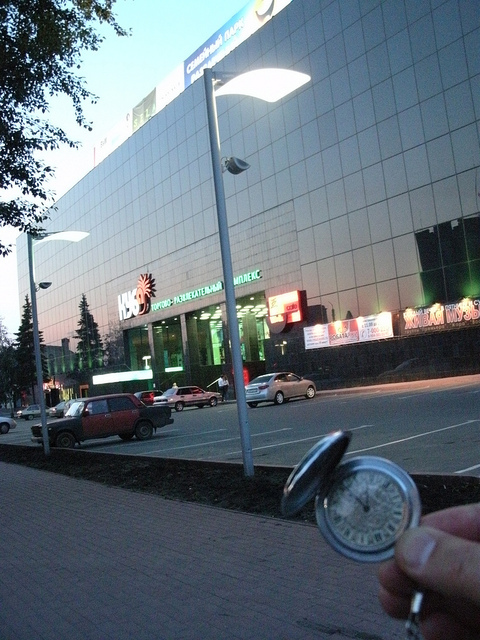 In honor of my desire to make a pilgrimage to the Molnija watch factory (I am carrying the watch I puchased on the internet in 2004 that was made by hand in Chelyabinsk at the factory founded by Stalin), father Vlad brings me to a large building aptly named куб (The Cube) - a shopping mall that used to be the Molnija watch factory until it closed in 2007. We return to the hotel and say goodbye to Father Vlad. He gives me a hat and a t-shirt of Chelyabinsk bearing the camel symbol of the city. He presents Dan with a hand-towel also depicting Chelyabinsk. Back at the hotel, I use Father Sergey's CD drive to rip my language instruction CDs into MP3s for my mini-computer. Here is a link to all of my pictures of Day Twenty-Two. I'm a Lutheran pastor (Missouri Synod) in the New Orleans area.